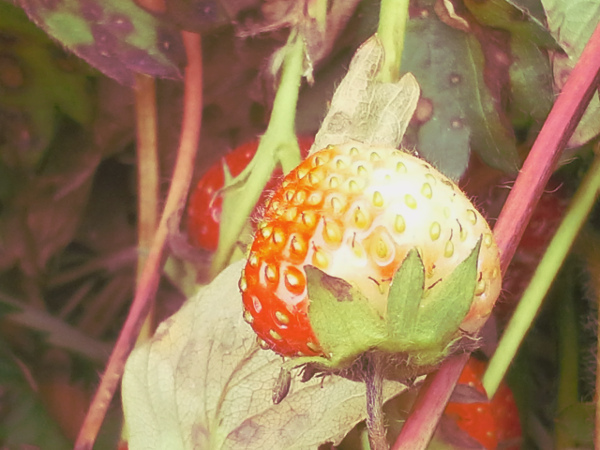 I’m not going to say this is the last post from the strawberry patch because tomorrow I go back to the farm for my CSA share; there may be gleanings we can gather from the field! 😉 If so, that’ll probably get me to thinking…just like it did last week…. Has anyone ever called an idea of yours—or you!—‘half baked’? They’ve probably said this with a sneer so you know it wasn’t meant as a compliment. Instead of being rude in return, do something unexpected: thank them. This is very true. And by thanking them, you will be standing up for yourself. You’ll be using their put down as a pull up. Instead of accepting that the term half baked implies something less than complimentary, think instead that it means half ripe, as in not quite ready. Pause a moment and examine your idea. Perhaps it does need further study and tweaking. It might also require additional time to grow and ripen before it’s ready to go. You can turn the Person of Hurt into a Person of Help by asking them what makes them say that the idea is half baked. You may get some valuable insights from your discussion. And you may make a new ally, if not a new friend! Your homework today is to not get all riled up if someone says something cutting or rude about your idea—or you. Look for the helpfulness and the truth in what they’ve said. Use it to improve your idea and yourself. Thank them for their honesty. Perhaps you’ve found someone who isn’t afraid to tell you the truth. PS Feel free to forward this, or any other post, to a friend.